Acapulco is in the family of cascading geraniums that have slightly different characteristics to the traditional ivy geraniums. Cascades are more heat tolerant, and can take temperatures up to 40°C without suffering like traditional ivies do. They also have thinner stems, less waxy leaves and the flowers only come in a single petal form. However, they make up for this by their sheer abundance of blooms, which far exceed any of the other varieties. Given the right fertiliser and sunny position, you will struggle to see any foliage through the flowers! Acapulco is my favourite of the cascades (which also come in red, plain pink, and white) as its pink colour is very striking and is beautifully contrasted with a white centre. 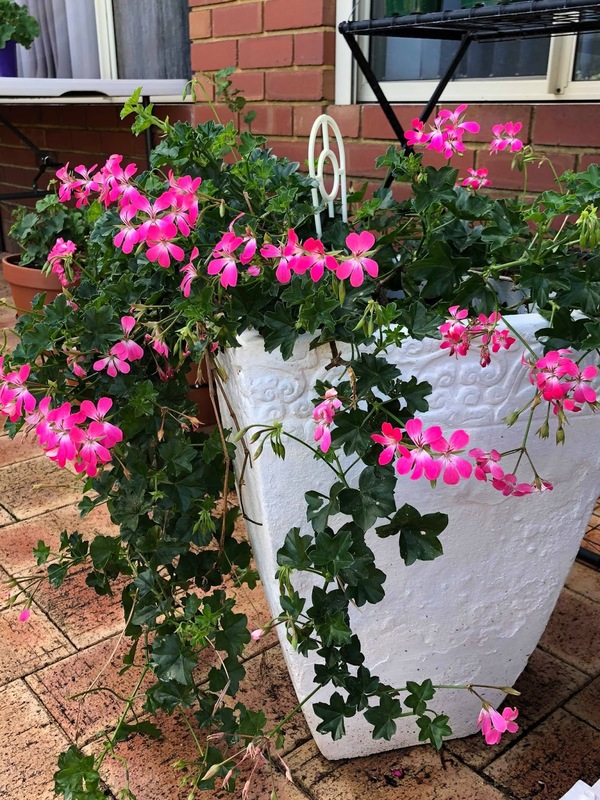 It looks simply stunning in a tall pot or hanging basket, with its leaves and flowers all cascading over the sides (see example below). Ok so I'm cheating a little bit with squeezing what is technically 11 geraniums into my top ten - but these two are fairly similar so I thought I could get away with it! My only gripe with Harlequin Picotee is that she is a rather leggy grower and so it's necessary to keep pinching new growth back and pruning regularly to maintain a more bushy appearance. But she has a long flowering period and is rather unique, so we can forgive that. Zeebra Lee is similar to Harlequin Picotee in terms of colour - she is also white with pale pink edging, but the flowers are very double and have a rosebud form. There is also sometimes a green pip in the centre of her flower which provides another factor of interest. 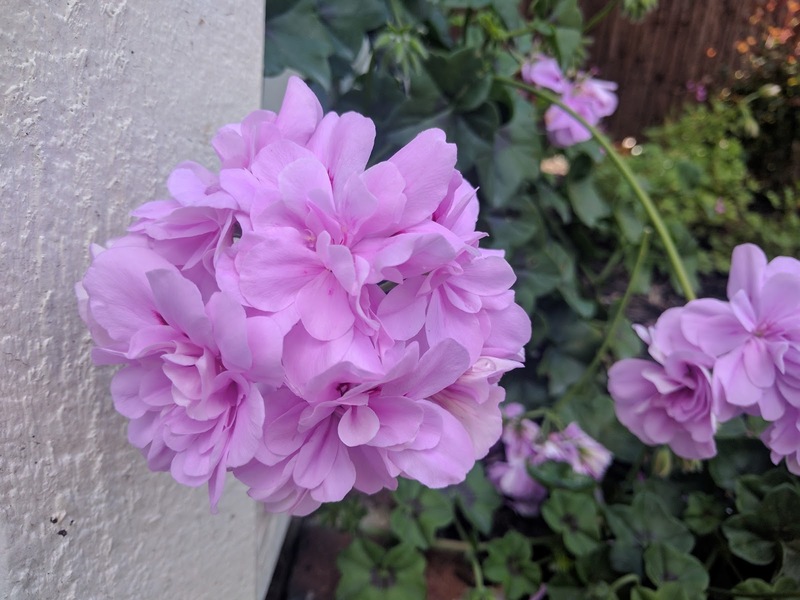 Being a very frilly double, the flowers last for quite a long time, and there is a fairly steady stream of them over most of the year. Zeebra Lee is a bushier and stronger grower than Harlequin Picotee so pinching back isn't required so much, however regular pruning will keep her looking healthy and producing an abundance of flowers. The Blush has potential to go higher up my list as she gets bigger because she has that one quality I am a sucker for - her flowers are pale pink. For now though, I only have two little plants of her and they got a bit neglected over summer so haven't been looking the best. The other thing I like less about her than her similar counterpart, Elsie Hirt, is that she has very delicate stems and they are a bit leggy in comparison. Hence her position at number 8. BUT what she does have over Elsie Hirt is her gorgeous rosebud form and white centre (which is quite unusual for ivy geraniums). I'm excited to see my plants grow bigger and how they will look then. 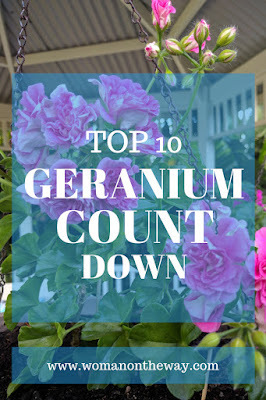 Royal Lavender is the only geranium in this list that you can get at Bunnings - all the others are fairly rare and you would only be able to get them by joining a geranium society like I have. Usually when a plant is common it reduces its appeal to me, but in this case no - it is a simply amazing performer and that fact cannot be ignored. I have Royal Lavender planted in the ground next to the entrance to our backyard gazebo (a position that doesn't get a lot of sun) and it just flowers and flowers and flowers, no matter the weather. 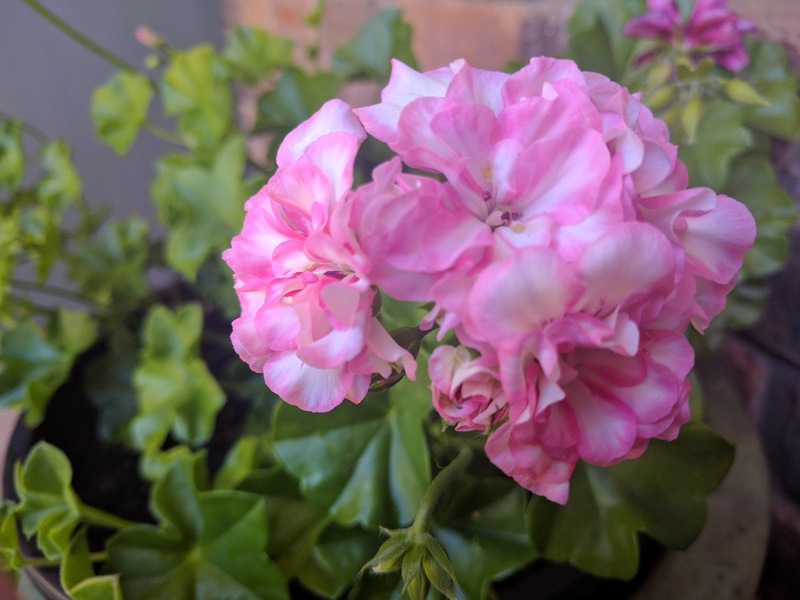 It has been eaten by caterpillars, sucked by thrips, exposed to over-watering by the sprinklers and rain and has not had the sort of care my potted geraniums have had, yet a bit of deadheading and pruning easily brings it back to its former glory within a fairly short space of time. Not to mention the colour and shape of the blooms are just glorious. I would recommend this geranium to the most novice of gardeners! Green Centred Galilee is one of those plants that only gets better with age. I found her a bit underwhelming to start off with - the flowers were a fairly ordinary pink colour, shape and size and the green pip was very small. 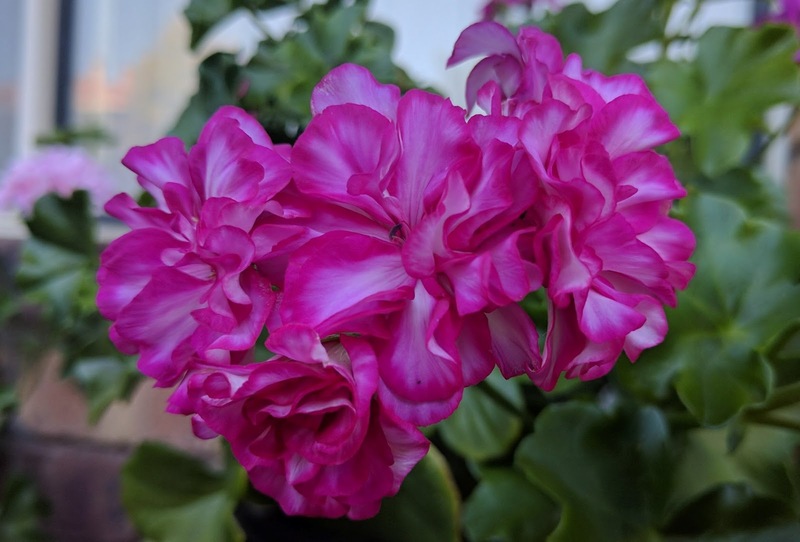 But the plant I have is coming up to about a year old now and the blooms are a lot more spectacular - they are larger, they are more double and frilly and they have a prominent green pip in the middle which gradually reveals itself as the flower opens and adds a lot of interest to its overall profile. I've included a photo of it all frilly and rosette-like, as well as fully open showing its green centre. Red Giroflee is a fairly new one for me, but she has quickly earned a place in my top ten because of the beautiful rich red of her blooms set against her deep green leaves (I simply adore deep green leaves, which not all ivies have). I have her in a planter box hung off one of the rails in our backyard gazebo and am already enjoying the splash of bright colour that she brings to that area. Rainbow Hannah Jane has my name in it (Hannah) so of course she must make it into my top ten! But besides that, she is really worthy of a high position simply because of the stunning flowers she produces. 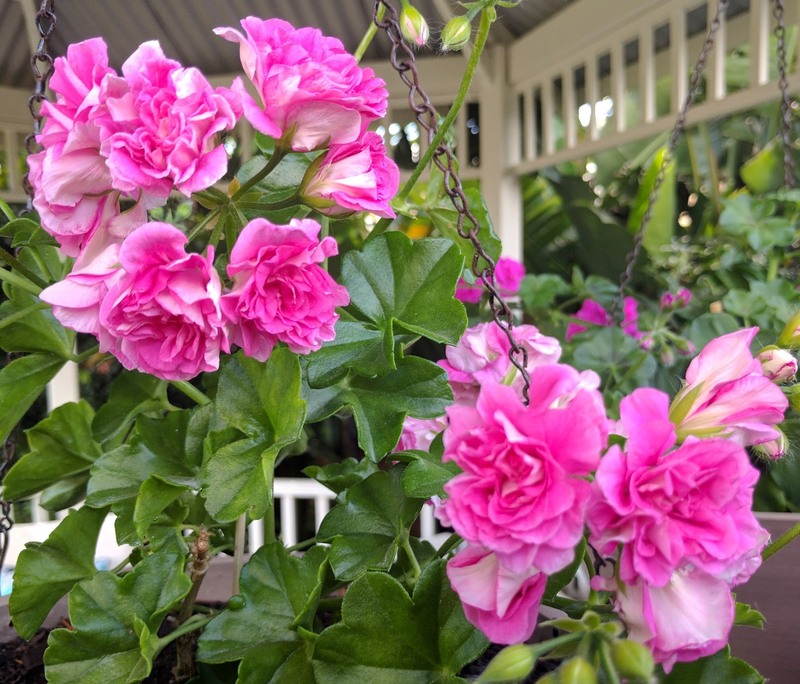 They are a beautiful purply-pink and white colour and have a double rosebud form. She is also a compact and bushy grower, although slow. Rainbow Hannah Jane is quite rare in WA, as she was hybridised in SA and a cutting was then brought over by one of the GAPSWA members, grown on and then more cuttings distributed once that plant was big enough. Elsie Hirt is so close to the top of my list for two reasons - her flowers are pale pink which is my favourite colour, and she is a very fast and bushy grower with glorious dark green leaves. 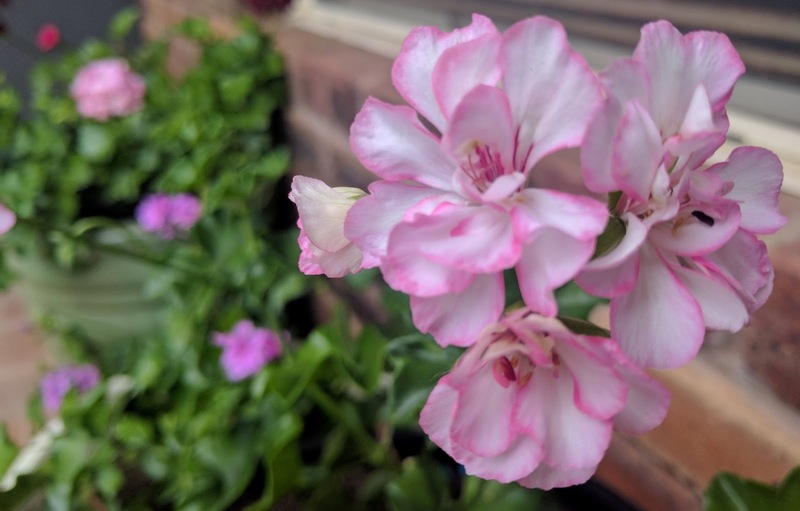 She doesn't get the top position because although her flowers are double, they are not in a rosebud form nor so densely packed and large as my top two geraniums. 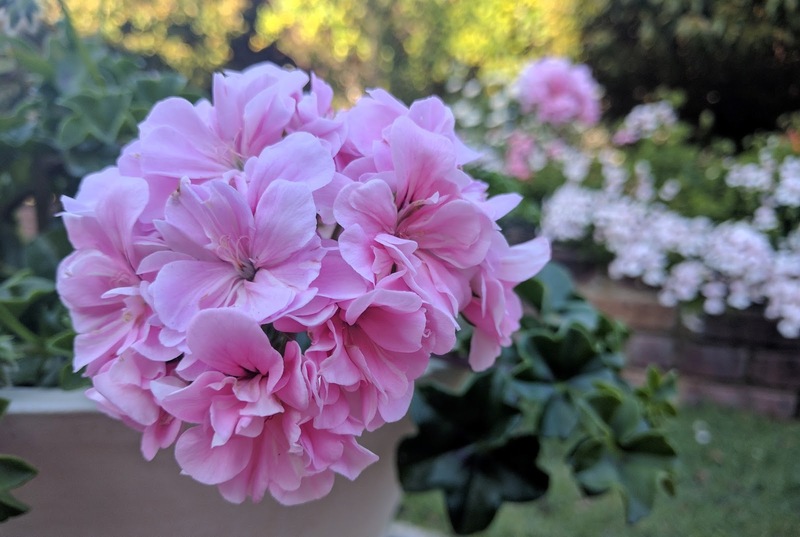 She flowers abundantly though and responds extremely well to pruning, getting so bushy that there is no need to tie her to a support (like many other ivy geraniums require). Sybil Holmes is the parent plant of my top geranium so it isn't any wonder that she is just as beautiful. I only prefer my number 1 because of her delicate colour - Sybil Holmes is a much more striking pink. All the other characteristics are the same though - slow, compact, bushy growth, glossy green leaves and flowers that last an eternity. The buds are so densely packed with petals it's amazing. Unfortunately Sybil Holmes does not cope well with the heat and I was actually worried I might lose her over summer - a lot of leaves got burnt and fell off and she was looking rather bare and sorry for herself. 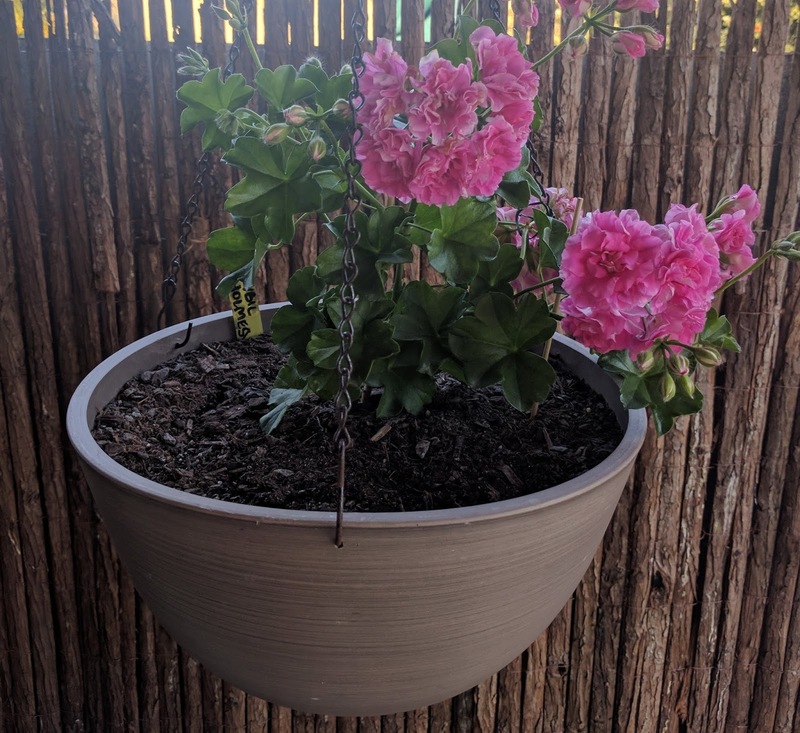 About halfway through summer, I ended up moving her into a totally shaded position which seemed to prevent any more damage, but it took a while for her to recover. She is looking much better now though and has quite a few buds - I'm looking forward to the next lot of flowers! Patricia is my all time favourite geranium and is actually a sport of Sybil Holmes. In other parts of the world she is known as Jackie Gould, but the person who first hybridised her named her Patricia, so that is her correct name. Patricia has naturally compact, bushy growth and produces an abundance of the most gorgeous pale lilac rosebud flowers. 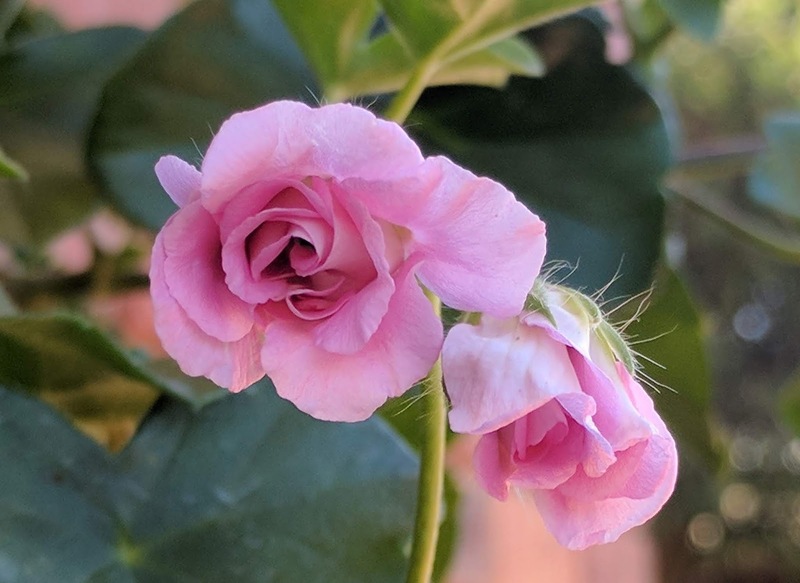 The flowers last a very long time (sometimes up to two weeks) and open very, very (agonisingly) slowly, so you will get some flowers on the plant in tight rosebud form and others that have opened out to show all their many petals, looking almost like frilly clouds. It truly is the most gorgeous plant and is insanely popular with geranium collectors. It's just a pity she doesn't grow a bit faster! 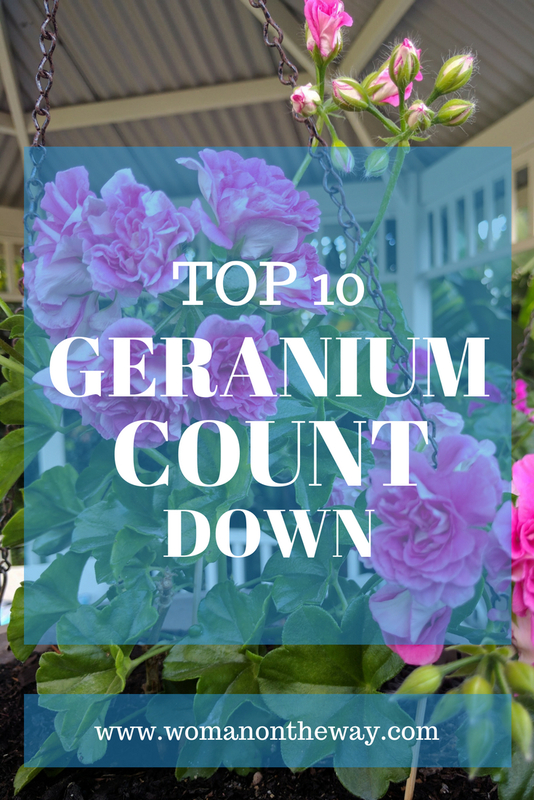 Well, those are my top 10 geraniums - which one do you like best? Or do you have another favourite that I didn't include? 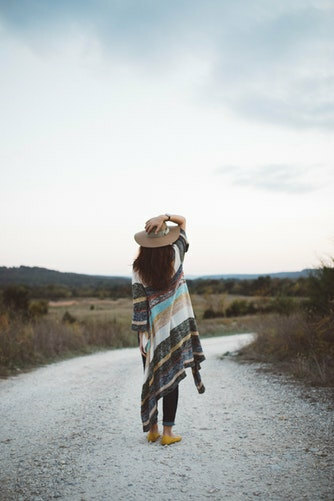 I'd love to hear from you in the comments section below :-). I didn't know there were so many types of Geranium, but I don't know much about flowers. Your pictures are breathtaking. All of them are beautiful, but I think my favorite is the Royal Lavender. Wow! Your garden is simply gorgeous. I had no idea there were so many different varieties of Geraniums. 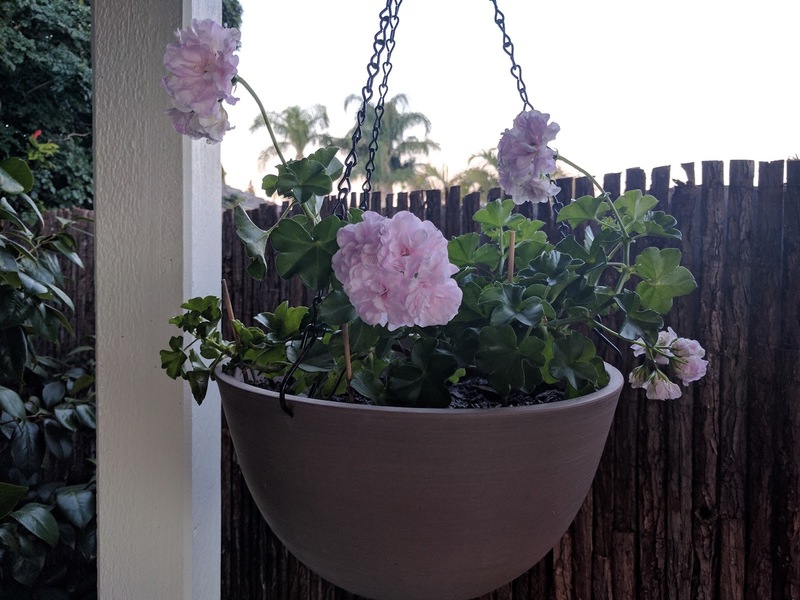 I just bought a bright pink Geranium for my daughter to take care of. We placed it on out front porch. It gets a lot of direct sun and is thriving. Now i'm going to research what kind it is. I liked Royal Lavender and Elsie Hirt. Very elegant, and so soothing to the eyes. Your post has lots of interesting information. Geraniums are so lovely, I have never seen most of these, I do like the common one ROYAL LAVENDER. Thanks for sharing these lovely creations.